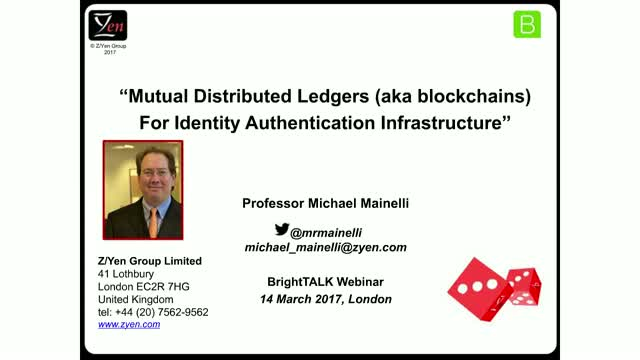 Mutual distributed ledger (MDL) identity schemes could empower people with personal data storage and management, permission frameworks for access by third parties such as banks insurers or governments, and even distributed reputation ratings. Such applications could reduce financial fraud, costs, and crime, and increase returns, confidence, and security. MDLs are uniquely supportive of controlled distribution and sharing of digitally-signed documentation and could form the backbone to identity and authentication systems worldwide. In fact, some claim that identity authentication infrastructure is the ‘killer app’ for MDLs rather than payments. While anti-money-laundering/know-your-customer/ultimate-beneficial-ownership processes are arduous for high-net-worth individuals, about 2.4 billion poor people worldwide lack official identification, about 1.5 billion over the age of 14. This webinar will examine how MDLs might aid both rich and poor.